We started this evening safari into the Masai Mara Reserve with the intention of checking one of the major crossing points on the Mara river. As we turned right to take the safari road to the crossing point, we sighted a huge herd of Impalas grazing alongside the road. Emmanuel pointed out that this was a herd with a single dominant male Impala with over forty female Impalas. He quickly added that male Impalas had perfected the art of polygamy. You can see a pair of sparring Impala here. 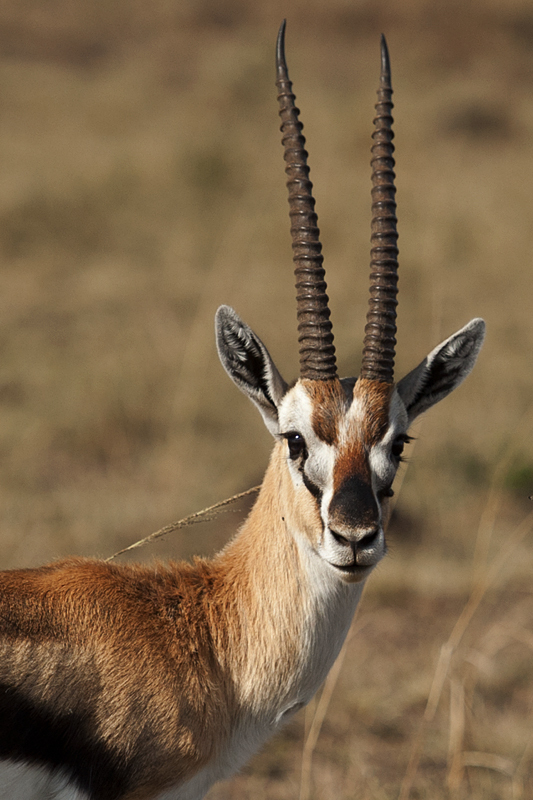 We moved ahead leaving the herd of Impalas only to be stopped in our tracks by a handsome male Thomson Gazelle (above). The strong sun was shining off his majestic antlers as he posed for a perfect portrait. As we came close to the major crossing point on the Mara river, we noticed vultures drying their wings, presumably after a sumptuous lunch comprising of the numerous carcasses that were lying scattered across the river. 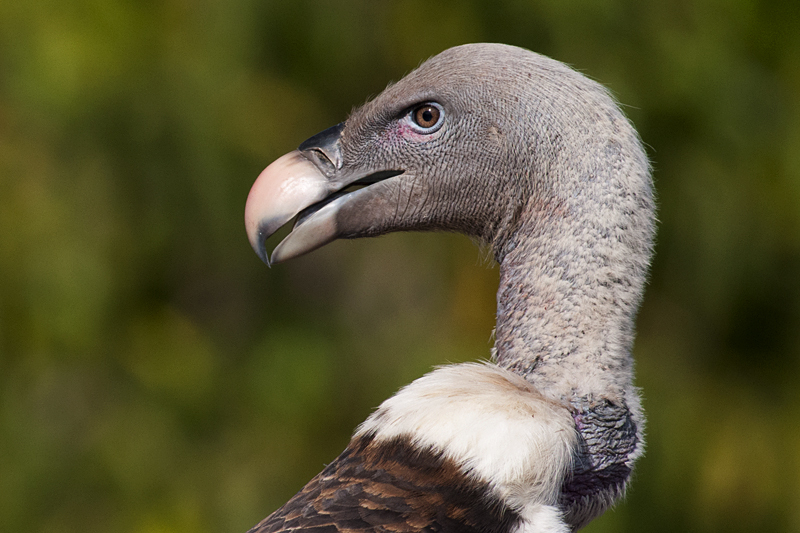 One particular Rippell’s Griffon Vulture (below) was sitting well within the reach of my trusted D300, 300mm f2.8 lens, 2x TC combination and we managed to get a decent portrait in good light. Another Nile Crocodile was leisurely tucking into the carcass in the middle of the Mara river. It seemed like a lazy afternoon at the crossing point. This lazy afternoon was interrupted when a herd of Wildebeest arrived at the crossing point and they moved towards the water’s edge. Slowly their numbers swelled into a few hundreds and they started filling up the river bank at the crossing point. 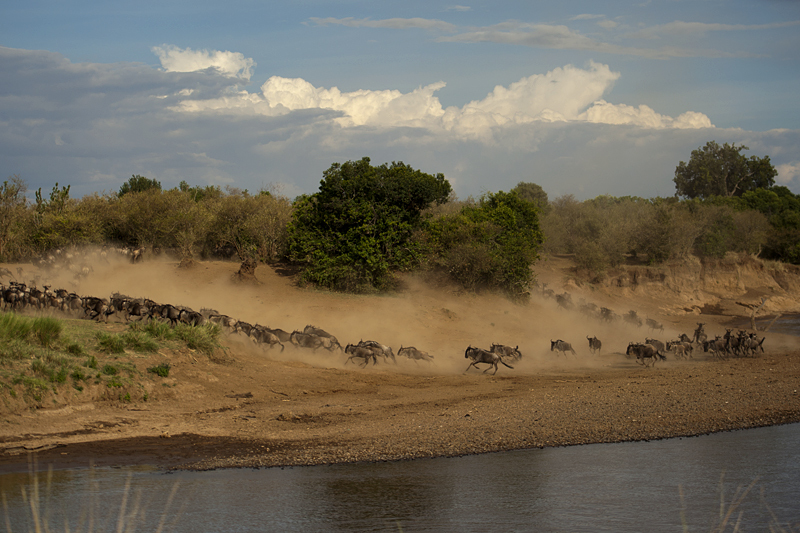 The congregation pushed the Wildebeest herd closer and closer to the water’s edge, but something held them back from crossing over. Probably the presence of Nile Crocodiles or the many carcasses was unsettling them. But then all of a sudden it finally happened. Out of sheer instinctive urge to cross, one Wildebeest jumped into the river, swam across and made it safely to the other side. Encouraged by this, two more Wildebeest jumped in and started swimming across the river. 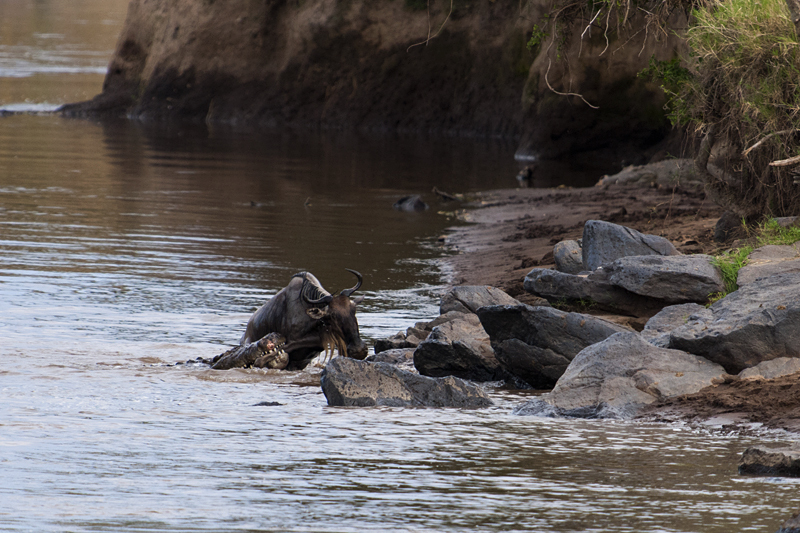 One of them successfully crossed to the other side and the other Wildebeest also reached the shallow waters near the opposite bank. Trying to get a foothold in the slippery rocks it missed a step, slipped and fell back into the water. As it struggled to regain its foothold, we realized that the reason for the Wildebeest missing its foothold was because a massive Nile Crocodile was biting into the Wildebeest’s side and pulling it back into the water. In spite of its best efforts the Wildebeest was overpowered by the crocodile and pulled deeper into the water away from the shore. Once into the water, the crocodile switched its fatal grip to grasp the Wildebeest’s snout (below) and dragged it deeper into the water to drown it. 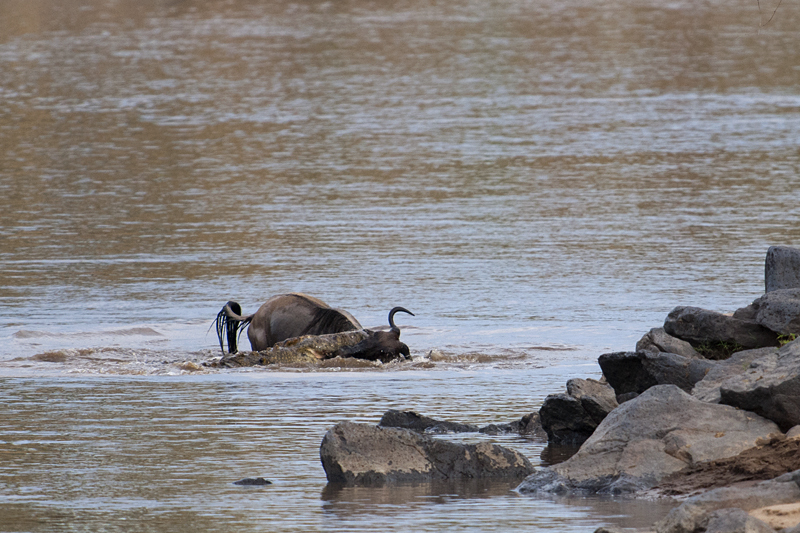 Soon, both the Wildebeest and the Crocodile simply disappeared into the mystic depths of the Mara river. 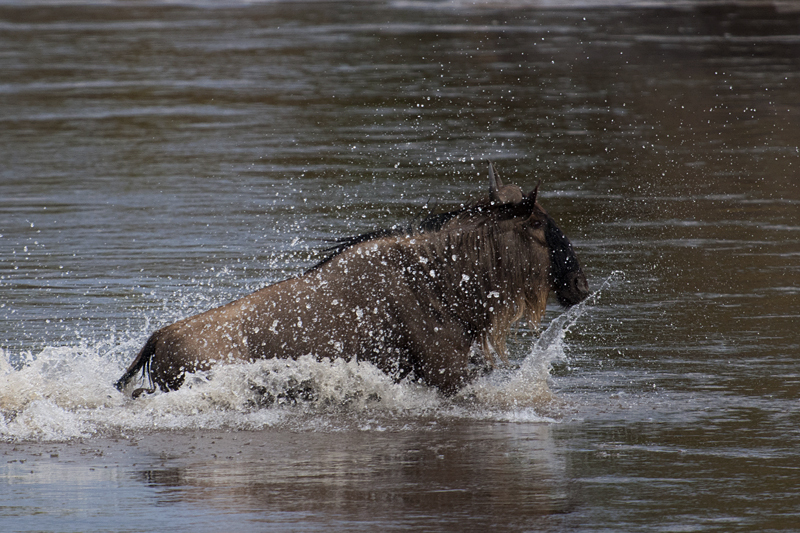 While we were still reeling under the impact of this deathly duel, a juvenile Wildebeest (above) jumped into the water, unmindful of what just happened, and started swimming. Every tourist watching this crossing egged the juvenile to cross over quickly before another crocodile pulled it down. And thankfully for all of us, it safely did. But the killing of the Wildebeest set a panic wave among the rest of the herd and all hell broke loose. 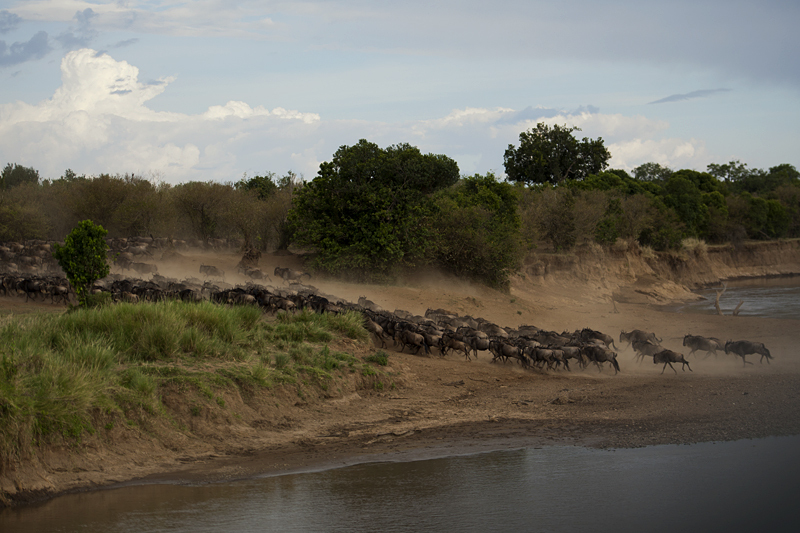 There was absolute pandemonium and chaos and the entire herd bolted back (below) away from the water in a cloud of dust. Minutes later they came running back towards the water (above) from one path, turn around and retreated with the same speed through the other path leading away from the water. The Wildebeest did not seem to settle down at all and at one point we were wondering whether this herd will ever cross the river this evening. While waiting for the herd to cross the river, our memories kept switching to the successful Wildebeest crossings and aborted Wildebeest crossing that we had encountered in the Mara Reserve. I am sure this was an evening to remember! Thanks for this gripping narrative and the wonderful photographs. 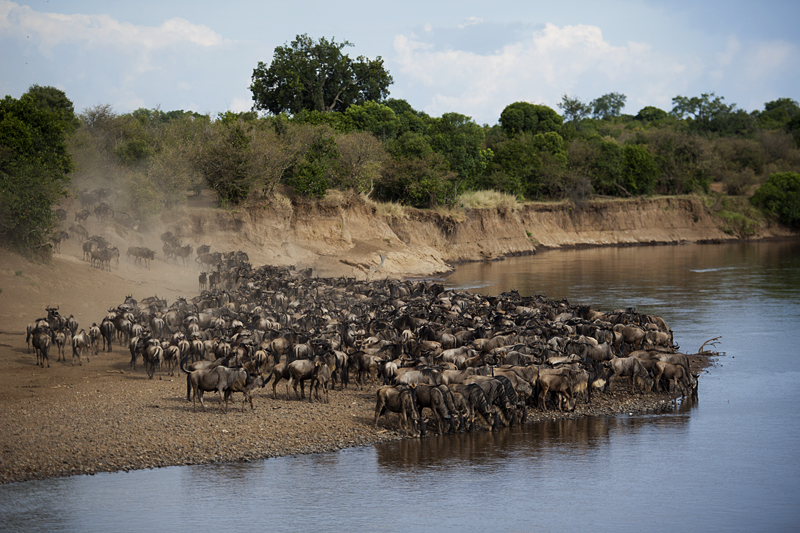 The Wildebeest crossing is still on my list of what I would like to see. Great shots.